WASHINGTON COUNTY — During the month of September, the seven branches of the Washington County Library System join with the American Library Association and public libraries nationwide to promote the value of possessing a library card and ensuring that every student obtains one. 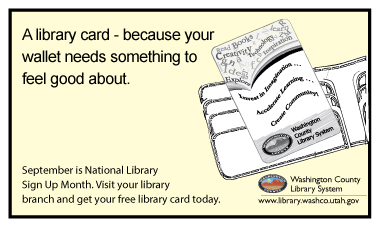 Library cards allow people to access a myriad of services and resources such as books, e-books, audiobooks, music, movies, and Internet and wireless connection through the Washington County Library System. They also allow students to access online resources from home including Learning Express, Student Research Center and Public Pioneer. Students learn in a variety of ways and, thanks to the resources available at the library, the needs of all ages and types of learners can be met — whether that is through homework help, STEAM programs or access print and e-books, Washington County Library Director Joel Tucker said. For more information on signing up for a library card, visit one of the seven branches in the Washington County Library System or visit the library system website.